What is the contact time for this please? This does not contain any antibacterial agents, therefore it has no contact time. It is used as a detergent cleaning product. Discover a cleaner that works in every environment with our Gompels Orange Multisurface Cleaner. Developed for use by busy work environments, this hard working formula has been created to leave both floors and worktops sparkling. Scented with a fresh and zesty orange fragrance, the powerful mix soaks through stubborn dirt and grease, breaking them down quickly and allowing them to be removed with one swipe. 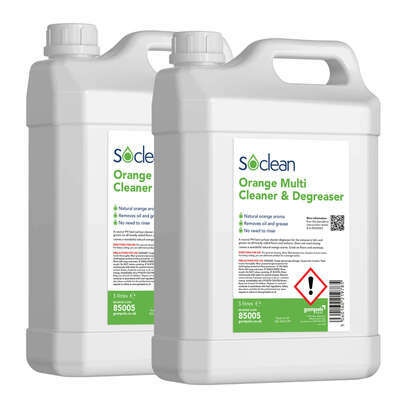 With it's neutral PH, this multisurface cleaner is also rinse-free which eliminates the need for additional workload and effectively saves you money. Suitable for use both diluted and neat, it works best alongside warm water and offers all round cleaning in a single bottle. This 5 litre twin pack is delivered in durable plastic bottles with comfortable handles and screw down lids for secure storage. With it's strong orange scent, we recommend steering clear of this multisurface cleaner in kitchens and opting for our Gompels Concentrated Foodsafe Cleaner instead. Don't forget to add other essentials to your basket as well including our Plastic Mop Bucket or our Soclean Everyday Wipes.